Cate: Please welcome Emmy Swain. Emmy, will you please share a short bio with us? Emmy: Thank you, Cate. 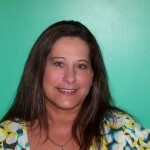 I am a single mother who has spent most of my life in the Chesapeake Bay area of Virginia. I have been an inventor, restaurateur, and business owner for over two decades. I can’t remember a day in my life without a pet. Franklin Bean is the latest addition to my family. I wake up to his smiles each day, and have embarked on a journey to share them with the world. Cate: Tell us about Meet Franklin Bean and where it's available. Emmy: Get ready for a world of adventure with the beloved Boston Terrier who’s magical powers come to life in the first of his superhero series, Meet Franklin Bean, available in paperback or ebook at Amazon http://amzn.to/ieEzwV Barnes and Noble online http://bit.ly/navEnN and several other online stores. This new children’s book tells the story of how ten-year-old John transforms his worries over his mom’s lost job, their move to a new town, and making friends with the bullies in the neighborhood with the influence and inspiration from his new adopted friend, Franklin Bean. Emmy: One of the fishermen said that Pancho Frijole grabbed the rope on the bow of the boat and pulled them to the beach. He made sure all of them had reached the beach safely before he flew off over the bay. “Did he talk to you?” the reporter asked. Emmy: Talking only to children and concealing his secret identity, Franklin Bean fulfills his mission to turn human tears into smiles by performing superhuman feats. Cate: Love that. Tease us with one little thing about your fictional world that makes it different from others. 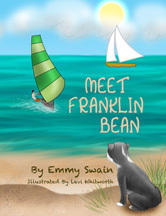 Emmy: Franklin Bean storybooks are written to encourage children to actively relate the characters’ situations to their real world. Intuitively, the words and illustrations reach into the readers’ imaginations, where real learning takes place. What else is magical is the level of engagement that is taking place. Both young and old are enjoying, while relating to the subtle life lessons. Cate: Wonderful. What's next for you? Emmy: I want to finish my second book of the Franklin Bean series, visit elementary schools, and help children feel good about themselves. I love to see a child smile. Franklin Bean can easily do that. I would like to continue with the series. Ultimately, I want to share his smiles and adventures with everyone. A portion of the proceeds of Meet Franklin Bean goes to the Worldwide Organization, Operation Smile. One day, I hope to join them on a mission. Emmy: I believe in the magical power of animals to heal and guide the human spirit. Meet Franklin Bean was born out of my conversations with my own beloved pets to help end the devastating effects of bullying. Franklin Bean is the pup of my son’s two Boston Terriers. I took his real life smile and created a superhero. Emmy: I want to have a writing routine. Between work and trying to market my book, my time is limited. However, my mind never stops and I talk and sing to my dogs daily, so there is always another story in my head. Emmy: Don’t you think that Franklin Bean would make a great cartoon? Cate: Readers, Emmy is giving away a paperback book to a random commenter... so start commenting. She'll pick a winner next weekend and announce the winner here. Thanks so much for being my guest, Emmy! Best of luck to you. Great choice in writers for you interview, Cate. Emmy. It much be a great feeling to write a book that influences kids in a positive way. I hope you have great success with it. I hope you get the time to continue writing. I also agree that we can learn so much about life from animals. It is a great feeling, Dannie! I think it is important for kids to explore their imagination and this book looks to be perfect for it. I also have pets that are special to me and could not live without. Good luck with your book. And the winner is ... Dannie Hill. I appreciate your comments and hope that we can do this again. Many thanks again to Cate, for this wonderful interview.